Pieced 18in Tuffet with Foundation and Guide by Sharyn Cole. A touch of whimsy for your home. 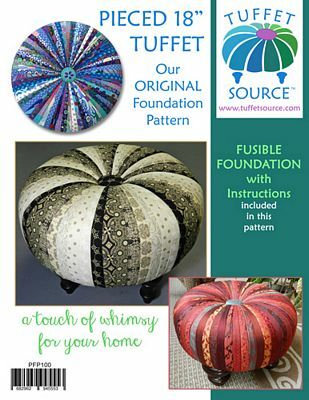 Instructions include step-by-step directions for tuffet making with Printed Fusible Interfacing. Highlights Include: * Detail construction diagram (8 page instruction booklet.) * Color photos to make you confident during each phase of the process. * Expert tips for success * Detailed supply list Exclusive printed fusible interfacing is a full-size panel image of cut lines and sewing lines printed on fusible interfacing, designed by Sharyn. Included are two interfacing panels each containing four foundation patterns which are required to complete on tuffet. *Cover of pattern is subject to change by vendor, if you receive a pattern that has a cover not matching this image - please note that there are no changes to the actual pattern and only to the cover.